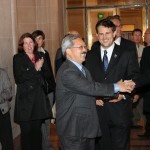 This is the first in a series of DEM Blogs that will highlight a San Francisco Hero. For those of you who don’t get our reference, we recently launched an iPhone and soon to be Android smart phone app called SF Heroes. The app is dedicated to promoting community preparedness and resilience. If you haven’t checked it out, we hope you will—and share it with your fellow heroes. And for those of you who have an Android smart phone, your version of SF Heroes will be ready this spring. SF Heroes can be found in the iTunes store. With the virtual rise of SF Heroes (those who download the app and earn badges to become SF Heroes), we also want to recognize heroes among us who promote resilience to emergencies and/or disasters or have done something extraordinary to support their community. We are honored to kick-off this special DEM Blog highlighting SF Hero: San Francisco Fire Department Lieutenant Erica Arteseros. This year’s Neighborhood Empowerment Network (NEN) Awards were awesome. True, they always are, but this one in particular was awesome. The NEN Awards are a big deal at SF City Hall. Pictured here is Mayor Lee joining the festitivies. Why? 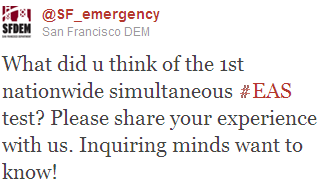 We think it is because San Francisco Neighborhood Response Team (NERT) was recognized twice. First for receiving a standing award called the Exemplary NERT Leadership Award; congratulations to Diane Rivera who received this one. And the second, also a standing award, is called the Most Empowering City Employee Award. Lieutenant Arteseros with San Francisco Fire Department and NERT leader earned this award. We say amen! 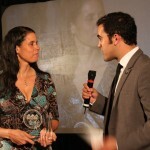 Lt. Erica Arteseros being interviewed by NENTV after receiving her award. Lieutenant Arteseros is responsible for one of San Francisco’s most important resident-focused disaster preparedness programs, NERT. NERT is a free training program for individuals, neighborhood groups and community-based organizations in San Francisco. It teaches hands-on disaster skills that help individuals respond to a personal emergency as well as act as members of a neighborhood response team. She works tirelessly to promote NERT trainings throughout San Francisco. She does the work of many to do so. Thanks to Lieutenant Arteseros, San Francisco has thousands and thousands of trained individuals who can assist in light search and rescue during times of emergency. Congratulations Lieutenant Arteseros for deservedly receiving the Most Empowering City Employee Award. You truly are a SF Hero. 1st Nationwide EAS Test: Pass or Fail? Our Tweet asking our followers to share their experience. 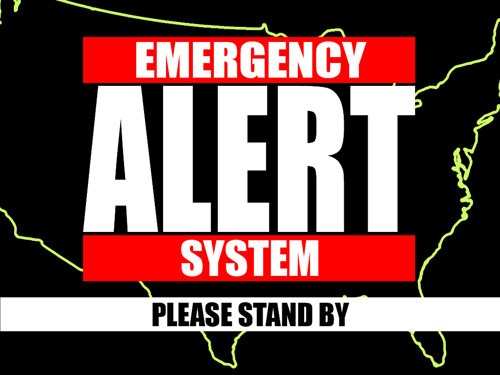 Last week’s first ever nationwide simultaneous test of the Emergency Alert System (EAS) was a major milestone for alert, notification and warning. A nationwide anything is a huge undertaking. Congrats to the Federal Communications Commission (FCC) and the Federal Emergency Management Agency (FEMA) for making it happen. We at DEM were primarily focused on getting the word out about the test. Because of some technical challenges we knew there could be some who would not understand the “this is a test” message due to hearing disabilities or limited English proficiency. 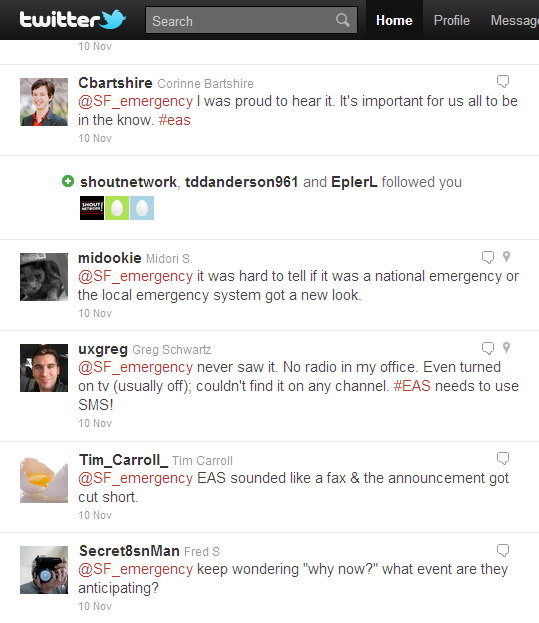 One of numerous Tweets about the EAS Test. That the test did not run on every station is something we will leave to the technical experts; however, communicating to our audiences what to expect was the real test for us. And of particular note, thanks to social media we live in an era where we could ask our audience what they experienced, and actually heard back! For this reason at a minimum, we think the nationwide EAS test was worth the effort and enthusiastically give it a passing grade. What we heard from some of our Twitter followers. That blue line – I’ve come to know – is the Emergency Alert System or EAS. It’s a public notification system used by television and radio to notify listeners of disasters. It is accompanied by an alert tone, a rather annoying one, and a message, either print or verbal depending upon the medium. Television and radio stations are required to test their equipment each month, but November’s monthly test will be a little different, because it is the first time the EAS will air simultaneously nationwide on all television and radio stations. It is a chance to move beyond the simple blue line.